Posted 11 January 2011 in Bonus, Cooke Looks, Jimmy Olsen #138. Wow, what a nail-biter this issue is! It’s an unrelenting juggernaut of a story that climaxes the Project story arc that basically started in JO #133. Jack’s depiction of Superman is simply awesome, whether our hero is smacking down the Four-Armed Terror or carrying a rather hefty atomic reactor over his head while in full trot! 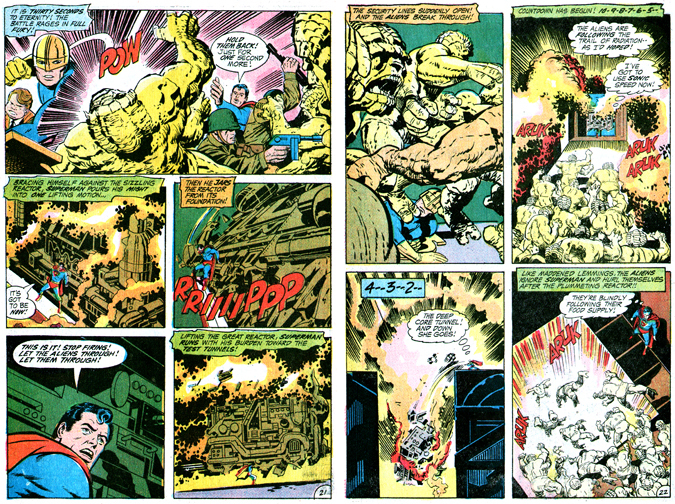 When I was a kid, as my brother and I would lay about our shared bedroom leafing through the latest Kirby comics, I distinctly recall when finishing a Kamandi comic book once, I’d snort, “Yeesh, that took me eight minutes to read,” like it was a bad thing. You know, this was when Jack had multiple chapters to an issue, each chapter opening with a full-page splash, never mind the requisite double-pager for the second and third pages… plus the regular pages typically had four panels per. I think I complained — I know I complained — because I wanted to spend more time in the throes of Jack’s imagination and, however brief, I still reveled in the experience. This, in my humble opinion, is the best the series ever got under Jack’s guidance, though there are lots more exciting, engaging adventures to come. Me, I’m a big fan of the Goody Rickels stuff, so you’ll not hear me say the series goes downhill… no, just the pacing changes and, for me, a humorous episode was perfectly timed following these stressed-out, ticking-bomb tales! Day 101: Miss Laura Conway! 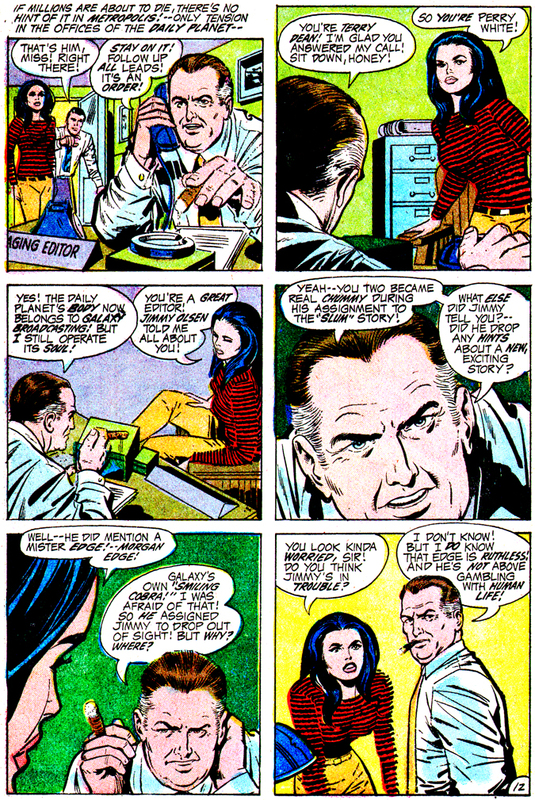 Posted 9 January 2011 in Day Entries, Earth, Jimmy Olsen #138, Supporting Characters. Miss Laura Conway is Galaxy Broadcasting CEO Morgan Edge’s personal secretary and she formerly served as the enigmatic Dabney Donovan’s “most trusted employee,” a fact revealed during the “Transilvane” storyline, where she was a more active player in the storyline than previously. Morgan Edge: Well, everything seems just as it did before I left! Any messages, Miss Conway? Miss Conway: Mister Edge! I didn’t expect you back so soon — you did leave rather hurriedly, sir! Morgan Edge: Well, you see, I learned that Metropolis would suffer an atomic explosion! 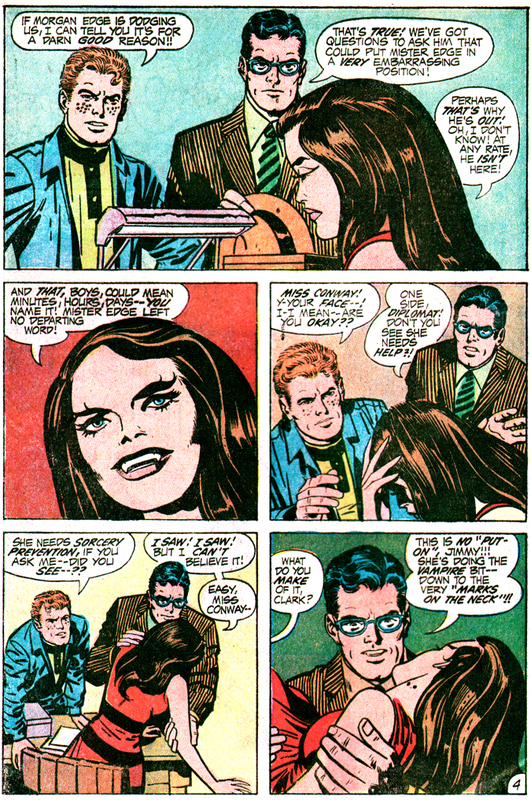 Miss Conway: Oh, er — Clark Kent called! He said that Jimmy Olsen is back — and they both want to see you! Morgan Edge: [Thinking] I’d have favored the atomic explosion! [Out loud] Miss Conway! If Kent or young Olsen calls again — tell them I’m still out! They can wait! I’ve got bigger fish to fry! How are we progressing on those contracts for Don Rickles? Miss Conway: Oh, Mister Edge! I just hope Don signs with us! He’s such a funny man! Morgan Edge: Never fear! I’ll reel him in! Later, Clark Kent and Jimmy Olsen ask Miss Conway some questions. Says Clark, “Is Mister Edge back yet, Miss Conway? Jimmy and I must see him!” Jimmy leans on her desk with a warning, “And don’t con us, Miss Conway! Some of the staff have seen Edge return!” Miss Conway is unfazed. “Then those same busybodies should have told you he went out again! However — Mister Edge left this for you both!” She hands Clark a small piece of paper. Jimmy says, “That looks suspiciously like an assignment slip!” And the boys are sent off to check a possible U.F.O. landing in Cronin Park. Like some sinister instrument locked on its invisible target, the man from Transilvane stands rigid!! Then–!! Rays emanating skyward from his eyes, the monster boasts, “From my eyes soars the power!! It will reach her — and create the mark which will make us — as one!! The power knows no distance! It projects for miles — to the city! To a building — to a window!! And beyond the window is Laura Conway — sleeping — sleeping — as the mark appears on her neck — to change her body chemistry! What has been done — is now done!! The reults of it will rival the most awesome events ever recorded!! When Laura Conway takes up the threads of her life the next day, at the offices of Galaxy Broadcasting System, her transformation is not ignored by Jimmy Olsen and his super-sonic sidekick, Superman, seen here in his other identity — Clark Kent! And the power — when it has fully taken hold — controls the body chemistry — controls the very body atoms — so that a pattern is followed — a complete and total pattern! But the white-visaged creature is on a mission and, giving the boys a nasty glare, tells them, “I said that I’m pressed by urgent action! And so it must be!! Behold the Evil Eye, gentlemen! It’s not a myth! For in it is power! And in the power there is irresistible force!” His right eye increasingly radiates until a burst of energy explodes from his pupil and there’s a giant ZZAPP! and the fellows are knocked off their feet. 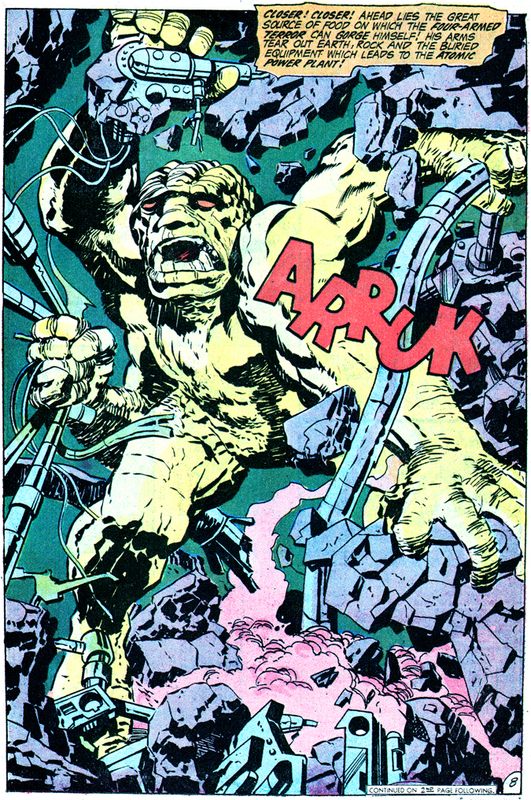 But Count Dragorin vanishes in a vaporous puff — as Clark Kent seizes a handful of air — and loses his balance!! 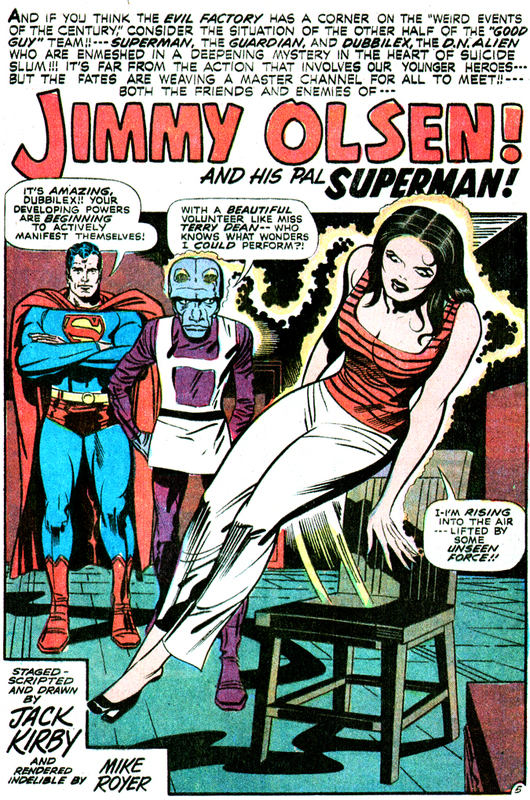 Yeah, there’s a ridiculous amount written here on her albeit few appearances in Superman’s Pal, Jimmy Olsen, but there’s not a whole lot to actually say about the character herself. She’s pretty but relatively nondescript, seemingly lives alone and appears devoted to her job and her current boss (even if he confesses though he heard the city was going to be disintegrated, she apparently wasn’t worthy enough to be privy to that knowledge… that “Oh, er –” response from her is precious!). Her old boss? She sells him down the river to a blood-sucking vampire pretty quick, don’tcha think? Day 100: Terry Dean, Disco Queen! 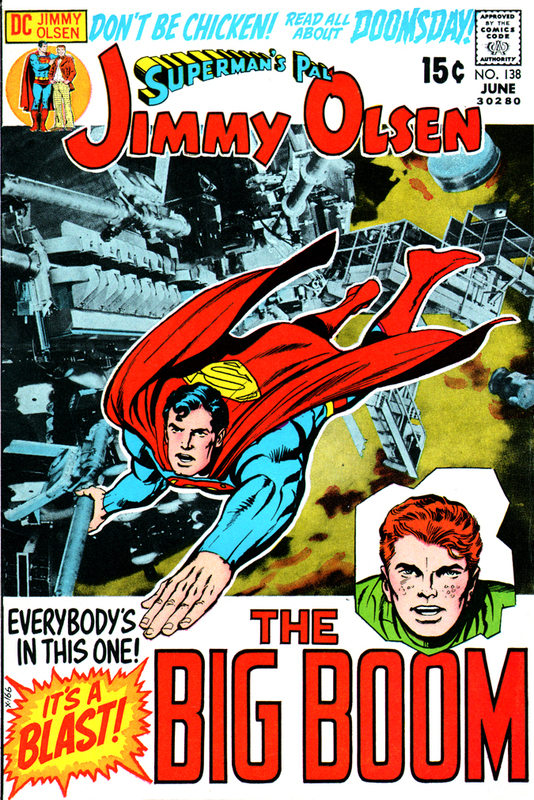 Posted 8 January 2011 in Day Entries, Earth, Heroes, Jimmy Olsen #138, Supporting Characters. Terry Dean: You’re a great editor! 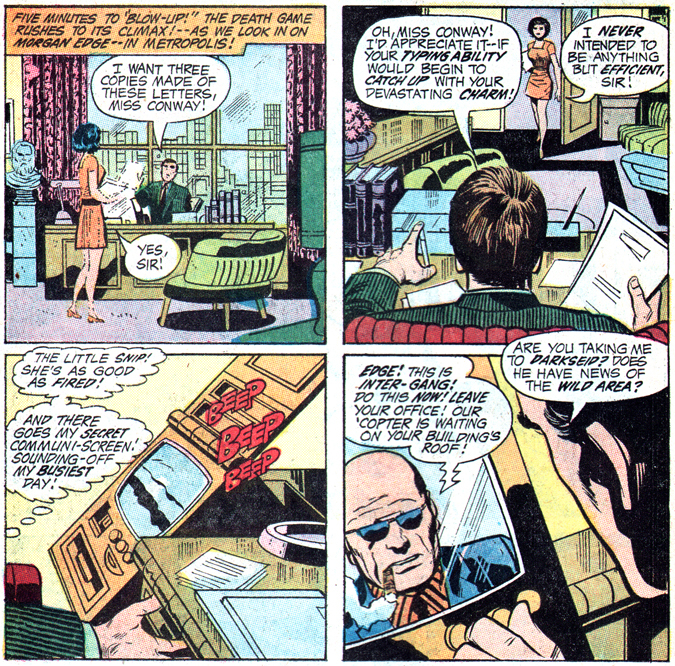 Jimmy Olsen told me all about you! Perry White: Yeah — you two became real chummy during his assignment to the “slum” story! What else did Jimmy tell you? — Did he drop any hints about a new, exciting story? Terry Dean: Well — he did mention a Mister Edge! — Morgan Edge! Perry White: Galaxy’s own “smiling cobra!” I was afraid of that! So he assigned Jimmy to drop out of sight! But why? Where? Terry Dean: You look kinda worried, sir! Do you think Jimmy’s in trouble? Perry White: I don’t know! But I do know that Edge is ruthless! And he’s not above gambling with human life! This one-pager feels dropped-in, so to speak, included maybe at the request of the DC offices to remind us that Perry White is still in the series and to give us a regular female character in the series. Maybe, maybe not. But Superman forgets his public identity!! Both he and the Guardian are besieged by autograph seekers! 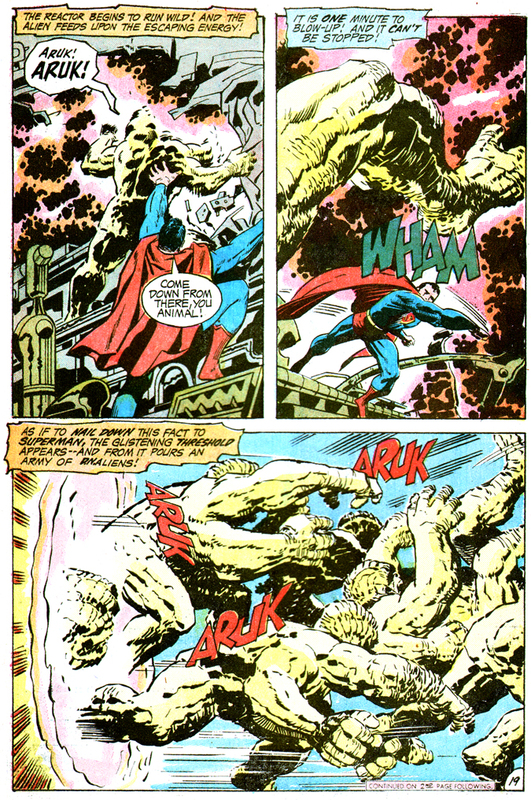 Suddenly the general clamor fades to confused whispers, as a bizarre figure confronts and surprises Superman!! Terry Dean: Hey! We’ve got a “U.F.O.” on the guest list! Far out! Who is he?? Bystander: Man! This guy is weirder than moon rocks! Dubbilex, the Superman’s favorite D.N.Alien, has arrived and he informs Superman of a nearby mystery. “Train your X-ray vision on the floor at your feet!!! … Your X-ray vision will reveal how I got here, Superman!” Superman replies, “I see it, Dubbilex!” Terry is startled, telling them, “B-but that floor is solid! We have no basement! !” Superman corrects his new friend. “Not a basement, Terry!! — A tunnel! It’s been shored up! But it still exists!” The Sand Diego Five String Mob,” sensing their cover is blown, call forth their “sixth string,” Barriboy, and their instruments become weapons that make a shambles out of the Cosmic Carousel!